Caption slip reads: "Photographer: Snow. Date: 1958-12-04. Reporter: Thackery. Assignment: Malibu fire. Special instructions: Develop 8 min.) 33-34-112: Helicopters take off with soldiers to fight fire. 111-89-90: Soldiers board helicopters. 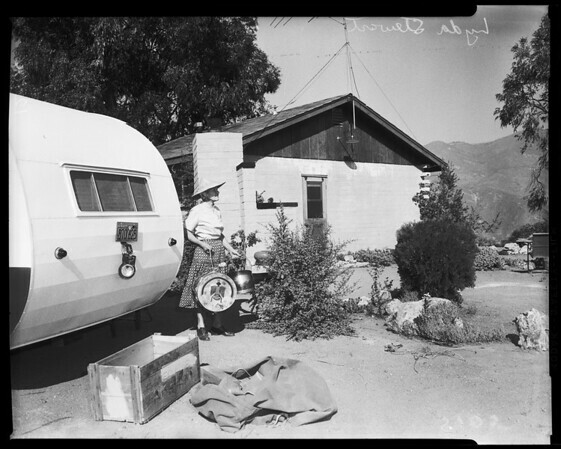 105-106: Lyda Stewart moving her belongings from trailer back into house in the Malibu Bowl section of Corral Canyon. This is one of few homes saved in area".